DELUXE FROSTY EDITION UPDATE OUT NOW!!! KEYBOARD AND JOYSTICK COMPATIBLE. 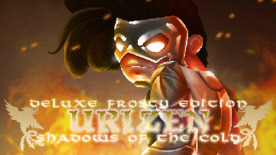 Stretch across lands of unforeseeable cold, and trouble in Urizen Shadows of the Cold Deluxe Frosty Edition!!! massive 46 warrior "head bopping", sword slashing platformer with characters raging from beasts, ogres, ninjas, knights, aliens, sorcerers, mermaids and demons. music from music composer Efe Tozan "Falanca"
the "Witches Hut" enabling the selling and trading of items for cash or items like potions. enemies killed will leave behind items that can be collected, traded or sold, at the "Witches Hut".